Bovine mastitis causes economic losses on dairy farms worldwide. Lactic acid bacteria (LAB) in animal health are an alternative tool to avoid antibiotic therapy on the prevention of bovine mastitis. In previous studies, 12 LAB isolated from bovine milk were selected taking into account some of the following characteristics: hydrophobicity, auto aggregative capability, inhibition of indicator pathogens, hydrogen peroxide, and capsular polysaccharide production. These LAB were considered because of their beneficial properties. In this work, we also analyzed the antimicrobial activity and the co-aggregation against mastitis causing bacteria, auto-inhibition, adhesion to bovine teat canal epithelial cells (BTCEC), and growth kinetic curves for the 12 LAB. Two of them, Lactococcus lactis subsp. 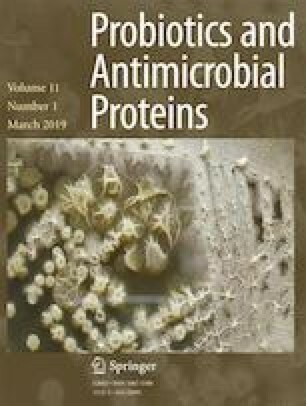 lactis CRL 1655 and Lactobacillus perolens CRL 1724, were selected because they had an interesting pattern of adhesion to BTEC, the inhibition of pathogens and the co-aggregation with the 100% of the assayed pathogens. They showed a predictable difference in the PFGE genomic pattern bands. The kinetic growth of these two strains was similar between them and with the rest of the assayed LAB. The strains selected in the present study showed indispensable characteristics for their inclusion in a probiotic formulation to be used at dry-off period for the prevention of bovine mastitis. These are the results obtained from the project called “Design of a probiotic product for bovine mastitis prevention” signed between Consejo Nacional de Investigaciones Científicas y Técnicas (CONICET) and Universidad Nacional de Río Cuarto. M. Pellegrino and M.E.F. Nader-Macías are career investigators of the CONICET, and N. Berardo is recipient of a fellowship from CONICET. This work was supported by grants of Secretaría de Ciencia y Técnica, Universidad Nacional de Río Cuarto (SECYT-UNRC) and Agencia Nacional de Promoción Científica y Tecnológica (ANPCYT- PICT 543).